This bedroom has many exciting elements. 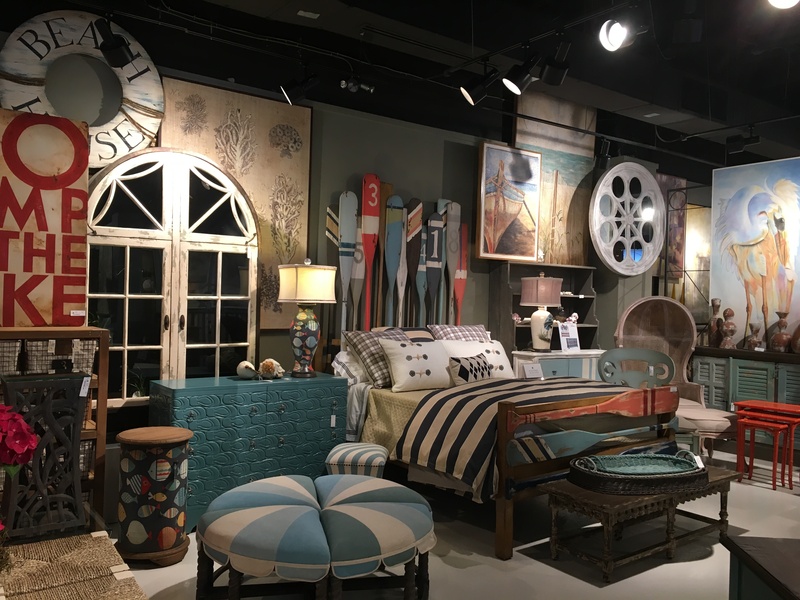 The oar headboard creates a dramatic effect and serves as the perfect statement piece in any vacation home or child’s room. The combination of athletics and creativity produces an aesthetically pleasing piece. The ottoman, alternating between white and various shades of blue, offers a pop of color that ties in with the hues of blue throughout the bedroom. Blue seems to be the base color of this room, ranging from the navy stripped duvet to the turquoise cabinets to the blue tray accessory at the end of the bed. However, this room is not simply blue! There is much contrast with fun patterns like the stripped pillows. Looking closer, you can see that this room truly fits our nautical theme with the detailed cabinet that is made up of aligning flip-flops. Even the side table and lamp portray a colorful school of fish to finish off this look. For more inspiration, check out the rest of the website, or contact us with your design dilemma.